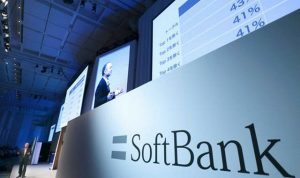 SoftBank Group Corp posted earnings that are beginning to reflect the transition it is making that makes deals and invests. The company’s operating profit reached 479.2 billion yen or $4.3 billion, which beat expectations on Wall Street for its quarter ending in June, as Sprint Corp, its unit in the U.S., posted a profit for the first time in more than three years. Sales ended the quarter at just over 2.19 trillion yen, which matched expectations, the company, which is based on Tokyo, announced on Monday. Founder of SoftBank Masayoshi Son has been relying for some time on the earnings from telecom and wireless operations in Japan, using that money to make investments and acquisitions. The Japanese billionaire is creating a SoftBank Vision Fund of $100 billion, which was included in SoftBank’s result for just the first time, to help speed up investments made in tech startups. The deal making will continue as well, with Sprint said to be pushing merger talks with rival T-Mobile U.S. Inc.
Underscoring the idea SoftBank is turning toward becoming an investor, the company posted losses on its derivatives of 257 billion yen, which helped to push its net income to just over 5.5 billion yen, far below expectations. The loss came from a financial arrangement from last year to sell Alibaba Group Holding shares through an established trust to raise funding. Since that time, Alibaba’s stock has jumped by over 80% which has forced SoftBank into recognizing the difference. Shares of SoftBank have increased 16% in 2017 and closed in Tokyo on Monday at 9,023 yen. The wireless operator based in Japan has a 9.9 trillion yen market value, while its shareholdings have a worth of more than 17.1 trillion yen. Son for years had said that his business was undervalued, and has urged investors to look at SoftBank as a goose that has golden eggs left. Even while Sprint has struggled to return to profitability and stave off losses of subscribers, Son looked at a possible merger with U.S. based Charter Communications, the second biggest U.S. cable provider. Son secured financing of $65 billion for the possibility of an offer to acquire Charter said people close to the situation. Sprint, at the same time, apparently has resumed merger talks with T-Mobile. Last week, CEO at Sprint Marcelo Claure said the decision on a possible merger is near, lifting shares of Sprint by up to 12%.